Got in a Toyota Tundra with 3 others, (2 of whom I'd just met) drove 8 hours to the Tijuana, and began the Taco Tally Challenge to try and eat 50 tacos in 4 days. And stopped at as many Fish Taco stands as possible from Tijuana to Mulege. At first, as a Fish Taco virgin, I was thrown of by the large piece of fried fish on a plain tortilla, but once you add the fresh cabbage, pickled onions, lime, avocado, pico de gallo, and special sauce there isn't many a meal that can top these for me now. 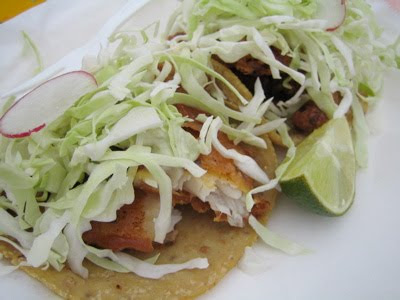 I have never seen a fish taco so I had no idea what they look like...they look really yummy!! Yes, fish tacos are delicious. With a name like that, you wouldnt' think so, but darn are they tasty! I love this and totally want to do it! Those tacos look amazing! and awaiting ANY good recipes from any of you!